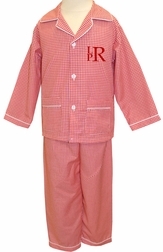 An adorable pair of red gingham two piece pajamas for little boys. The top button downs the front and has pointed collars on either side of the top button. 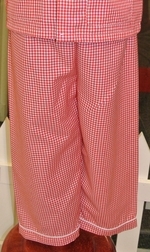 The front is made with 2 little pockets that are piped in white. Make it even more adorable by choosing a monogram in red.